A double negative is the use of two forms of negation in a single sentence. Two negations while used in the same sentence may mean only a single negation, while the second negation intensifies the other. Ideally, two negatives should cancel out each other and produce an affirmative response. For instance, ‘I haven’t got nothing’ should literally mean ‘I have got something.’ However, at times, double negatives may be used to intensify a single negative expression. Like, in the previous example – ‘I haven’t got nothing’ – the same sentence might have another meaning which is: I don’t have anything. Both the meanings are in contradiction to each other, and such a situation can only be resolved by further evidences to the situation through more sentences. Nevertheless such a sentences may lead to confusion and hence are usually avoided. Different languages may have their own way to determine the final meaning to such sentences. 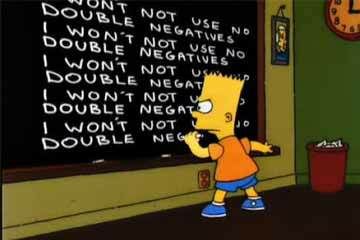 As for English, double negatives were widely used previously, until after the 16th century. Though, they are still widely used as in English dialects where it is already established that it wouldn’t lead to any kind of confusion. A person might say, “I don’t need no advice,” where what he strictly means to say is – “I don’t need any advice.” A popular example of the use of double negatives comes from the song Another brick in the wall, where they sing – We don’t need no education; we don’t need no thought control. Here double negatives are being used to intensify their emotions towards the situation presented.